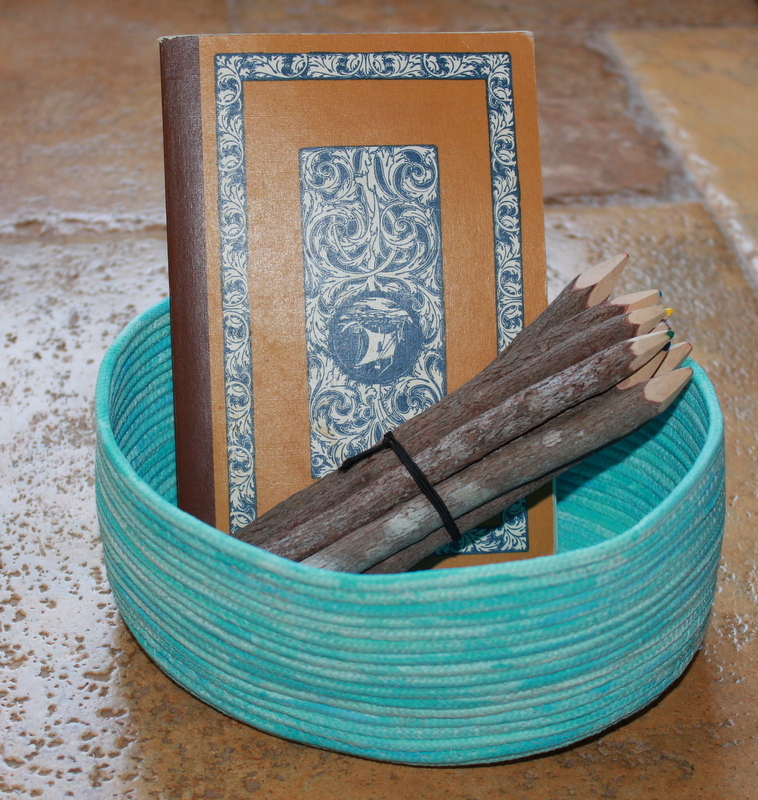 Here is where I got the clever idea and instructions to make the rope baskets. 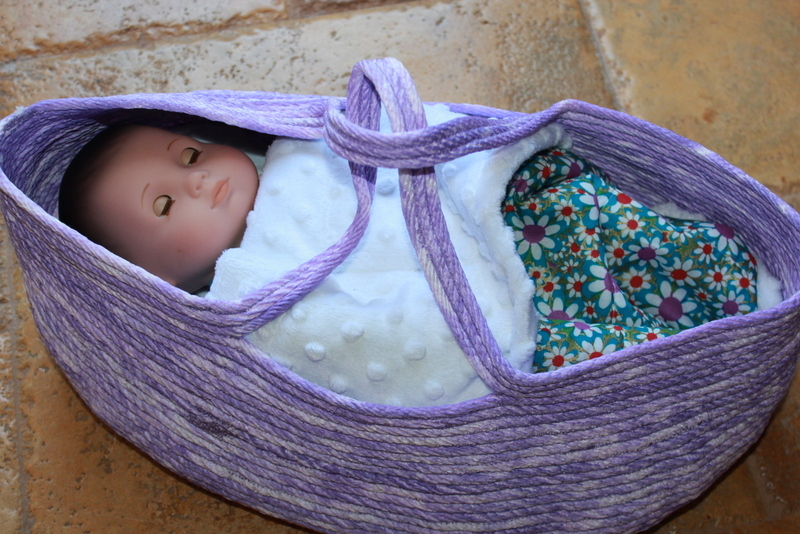 I took her idea and decided to make Moses’ baskets for my granddaughter’s Bitty Baby, it would also work for any 16″ baby doll. You will need to purchase cloths line rope, I got mine at Walmart. 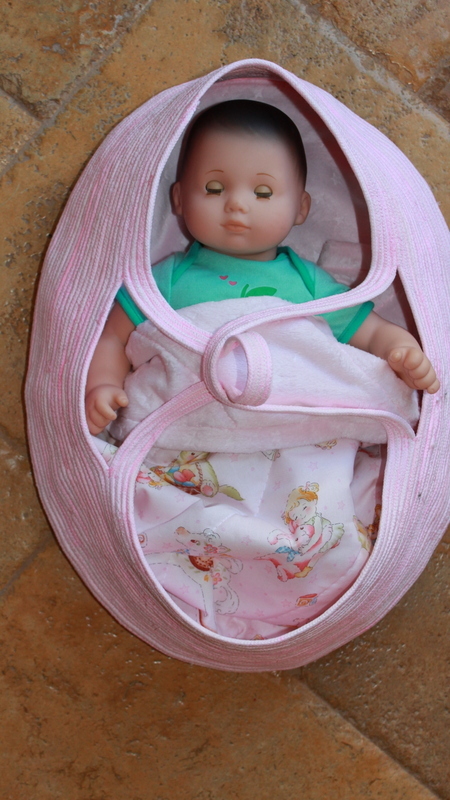 The Moses basket takes around 400 feet. 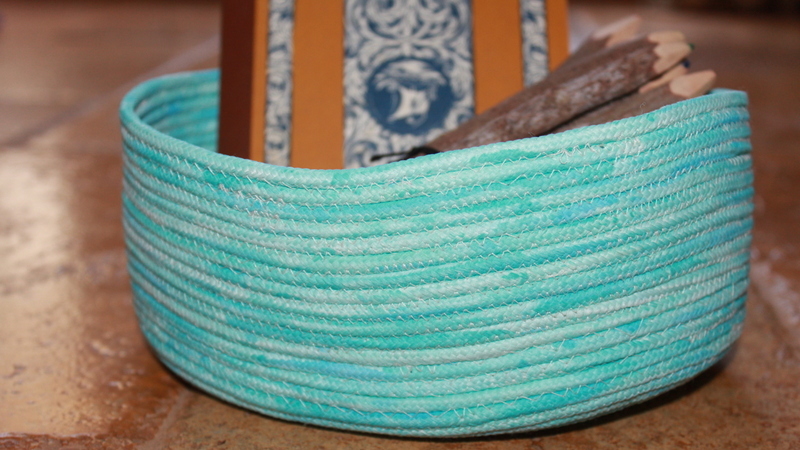 The cloth line rope comes in 25 or 50 feet lengths. 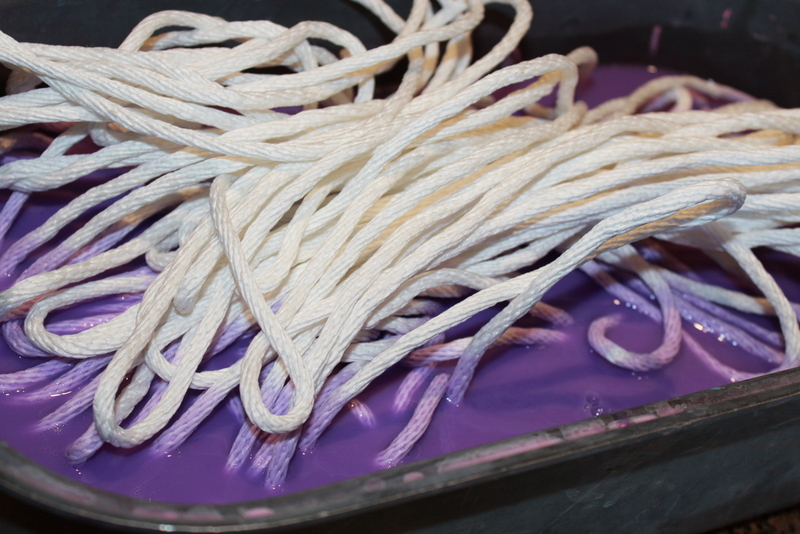 You will also need 2-3 spools of thread to match your paint color. It takes a lot and the bigger your zigzag stitch is the more thread you will need. 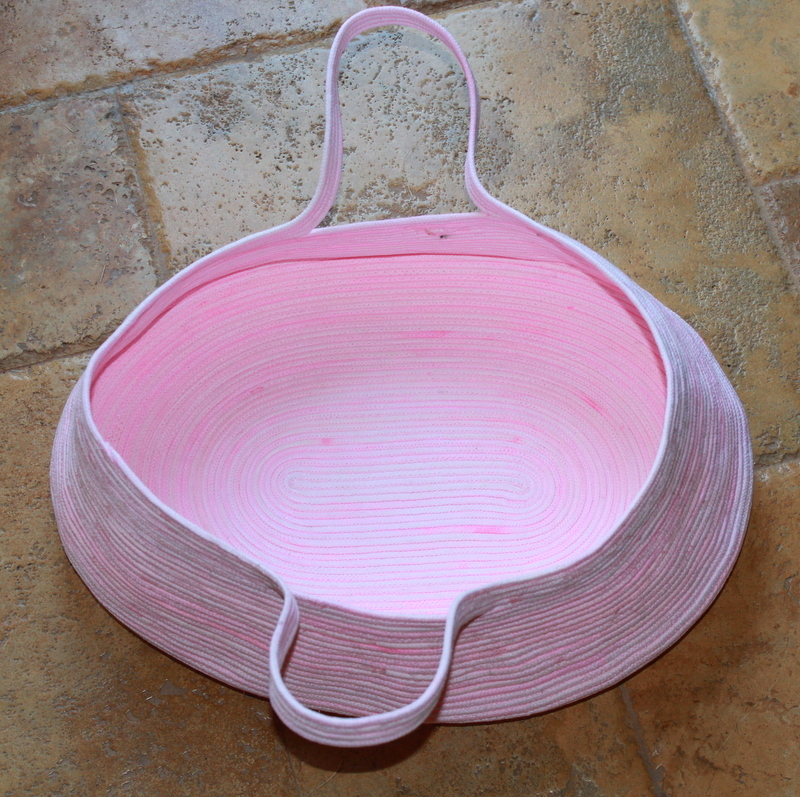 I have experimented with different ways to paint the basket and I found that this is the best way for me. 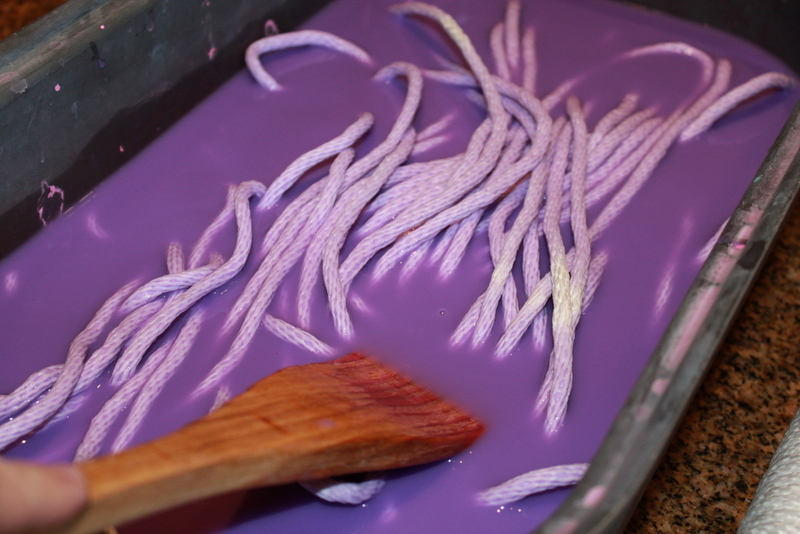 I dilute paint in water and stir it in, then I just soak my rope in the paint. 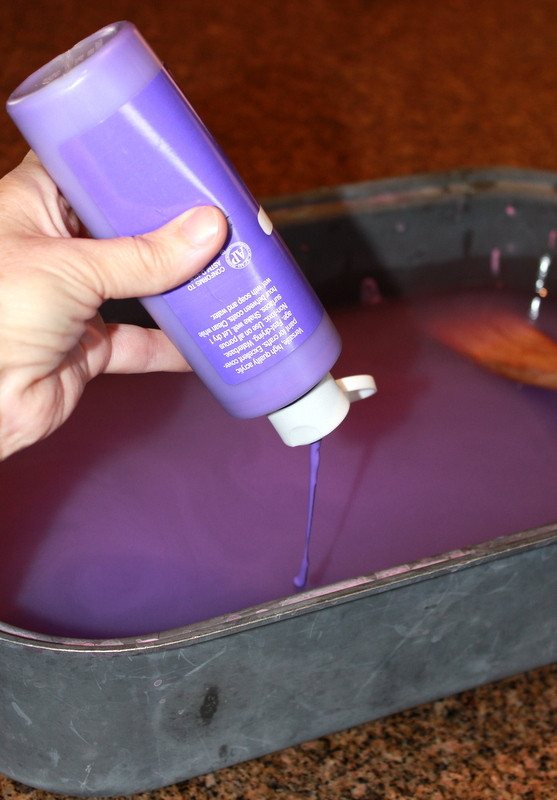 I turn it over a couple of times to make sure it’s all coated. 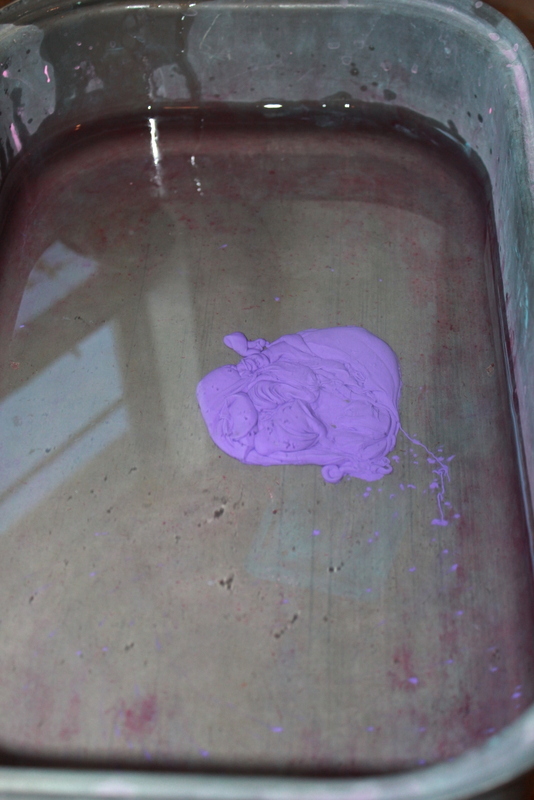 You can work with your paint until you are happy with how it turns out. 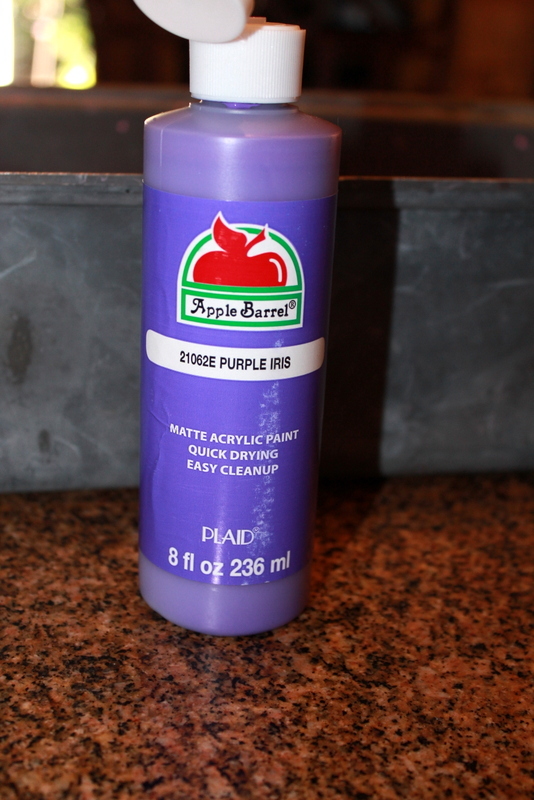 I used Apple Barrel paint purchased at Walmart. 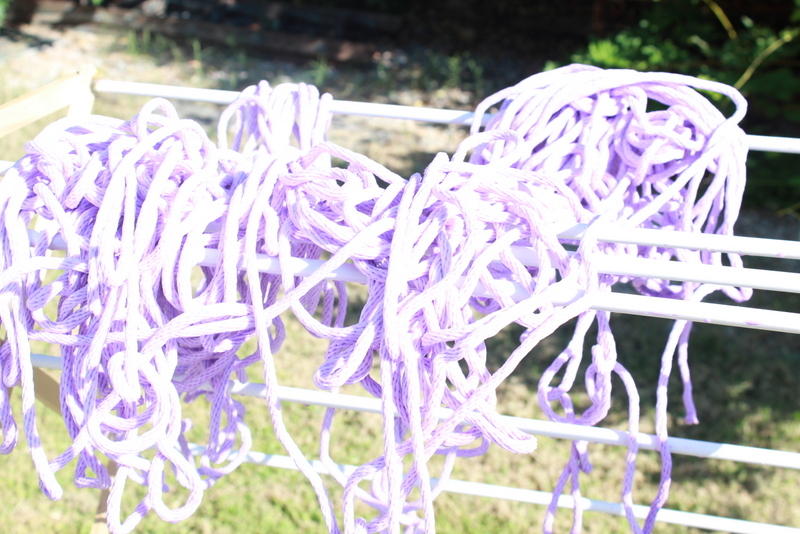 I dry it outside on my cloths line. 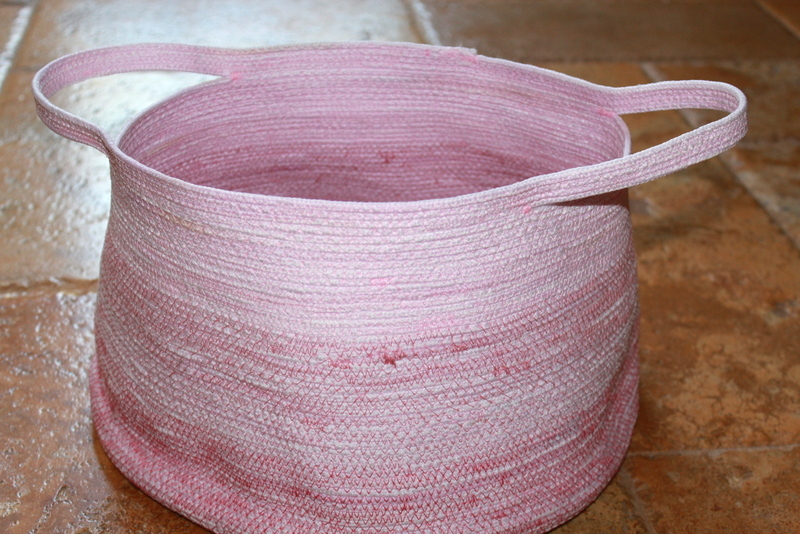 Once it’s dry you can start making your basket. 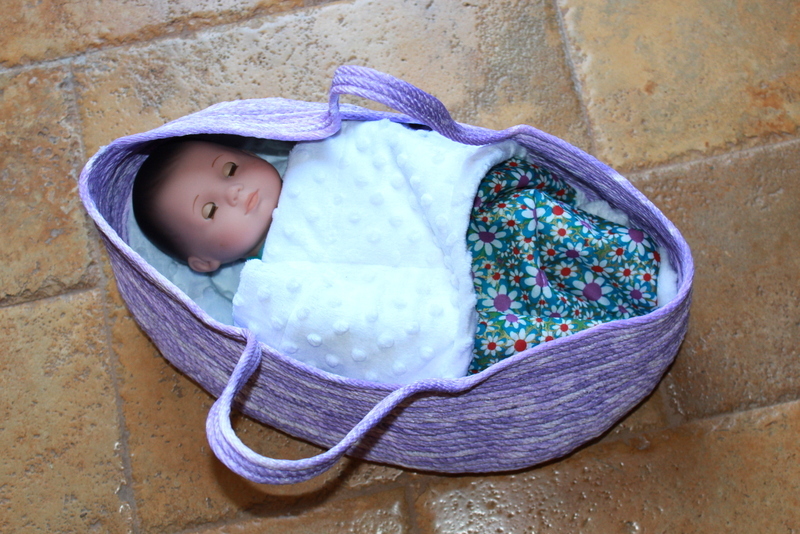 The Moses basket needs to be oblong, so I start with a 8-10 inch length of rope and sew two pieces together using a zigzag stitch, making sure to catch both pieces of rope with the thread. 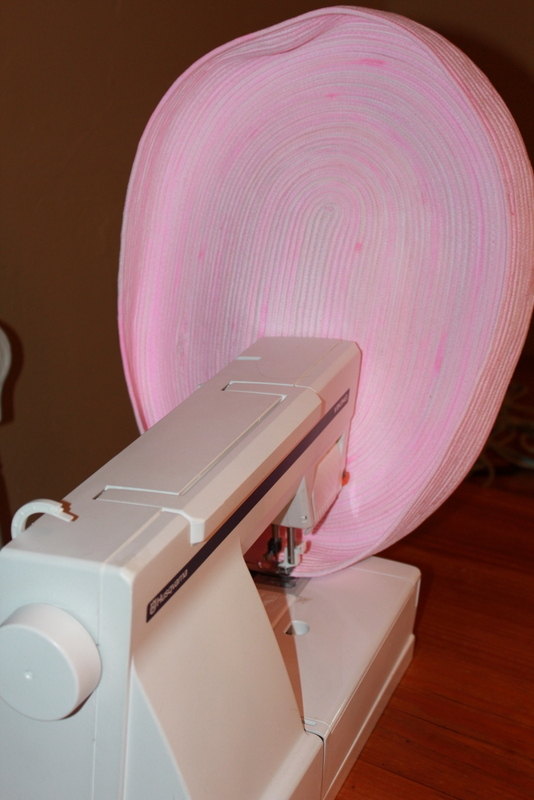 You will need to position your rope so that as you sew the bulk of your basket is on the outside of your machine. 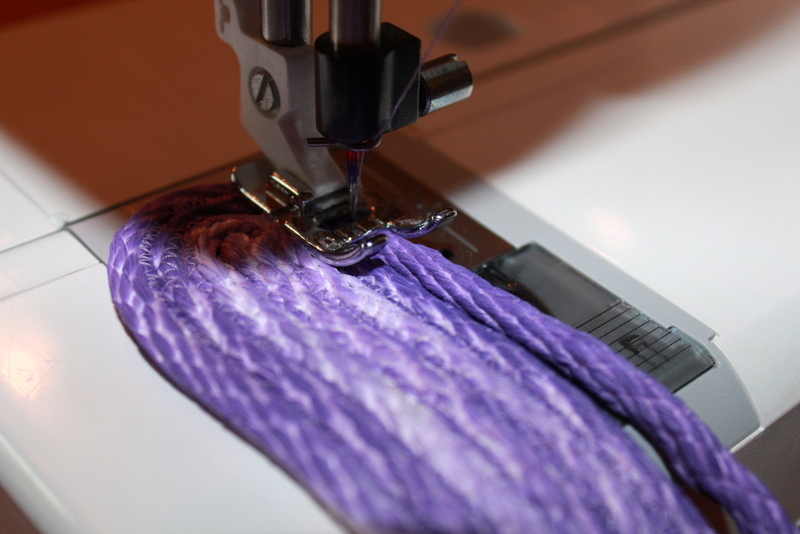 Continue sewing your rope around and around until you get your desired length. My bottom is 18-19 inches long. 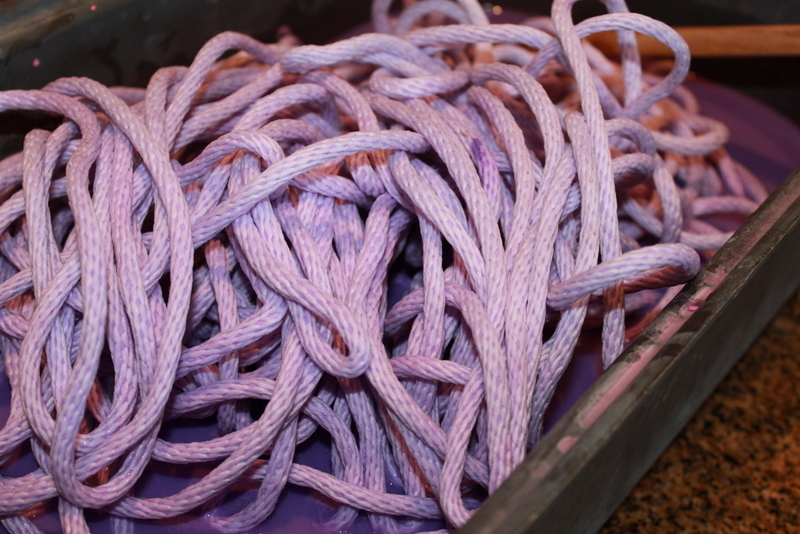 Once you get your desired length you will turn your rope on it’s side and continue sewing. 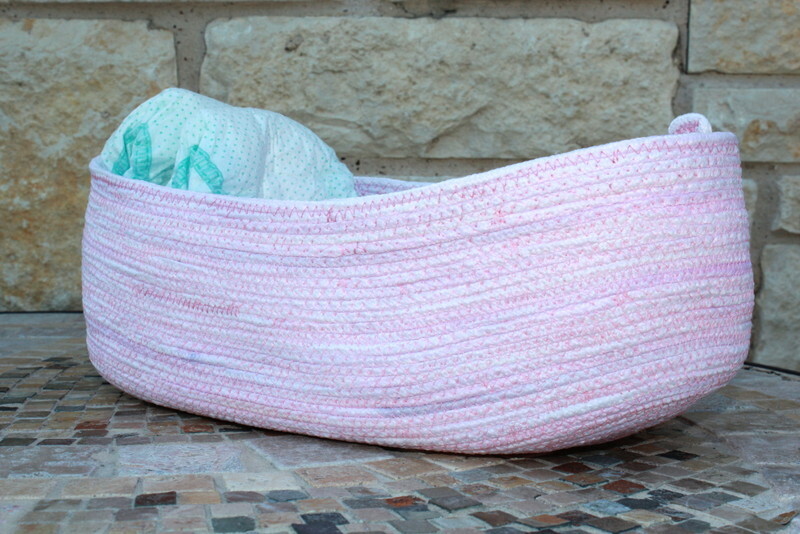 This will change the direction of your stitch and create the sides of your basket. 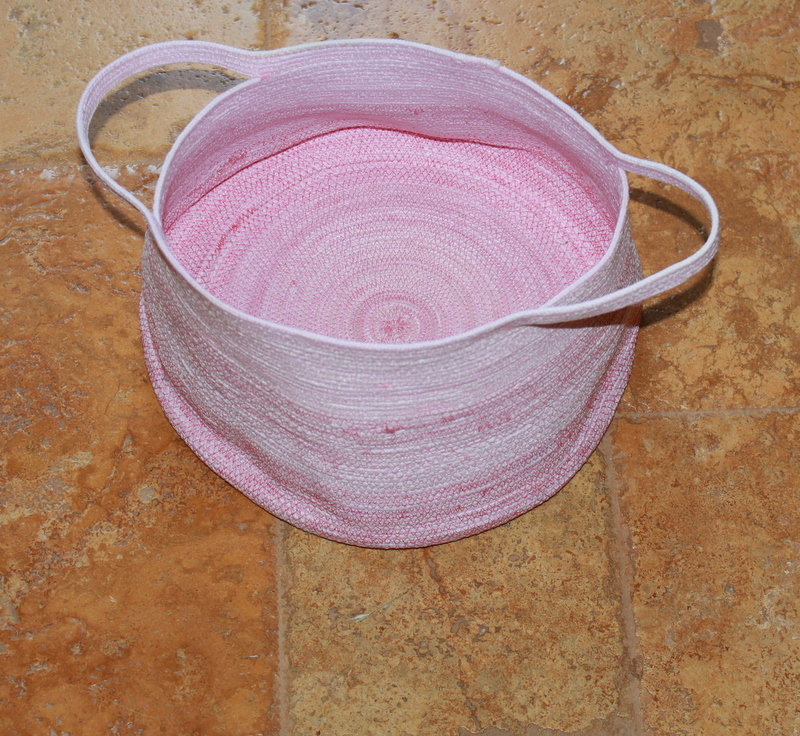 Continue until you have the desired depth of your basket, then you will make the handles. I measure and mark my four centers, then from my side centers I measure out about 2 1/2 inches on either side and mark it. I sew up to the first mark and secure the stitches really good, then I stop sewing and cut my thread. 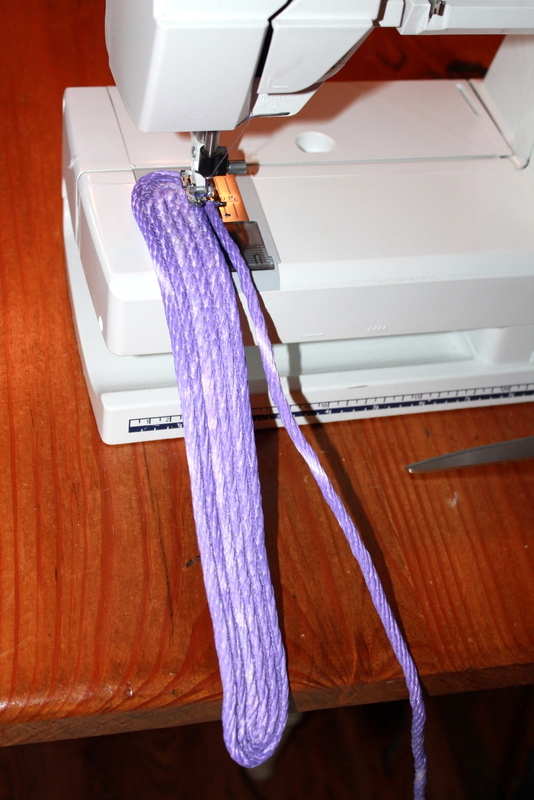 I measure a 10-12 inch length of rope and start sewing at the end of that length, starting at the next marked spot-making sure there is a 5 1/2 inch space between the two. 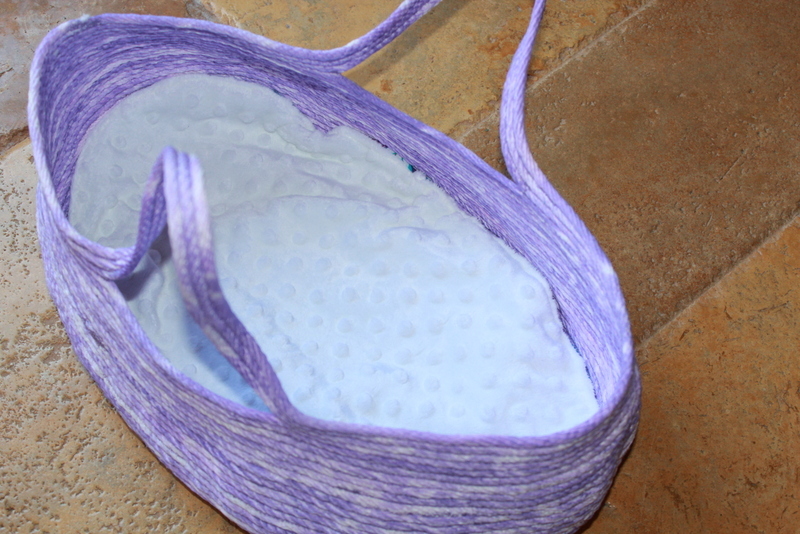 Continue sewing around the basket until you get directly on the other side of your 5 1/2 inch space-this should also be marked-and repeat the same thing you did on the other side. 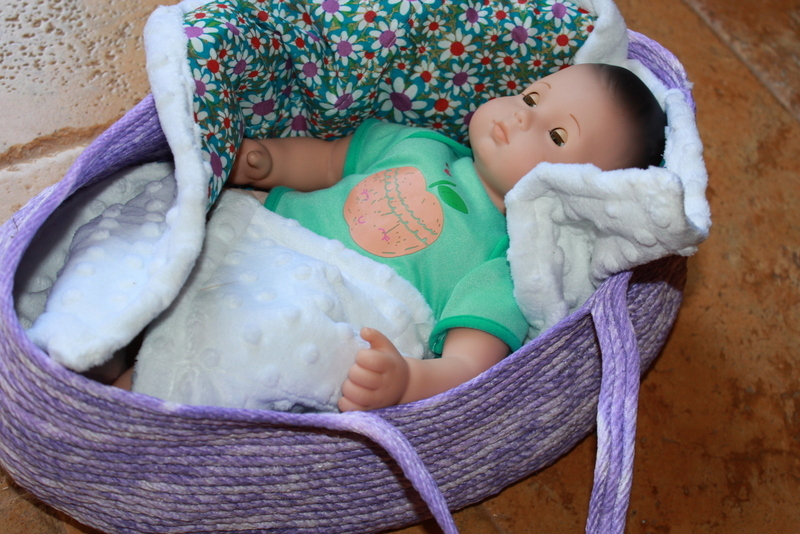 I made three more rounds to make the handle of the basket. At the long end of the basket I cut the rope and folded it down and worked it into the basket. Back stitch several times to secure it down. 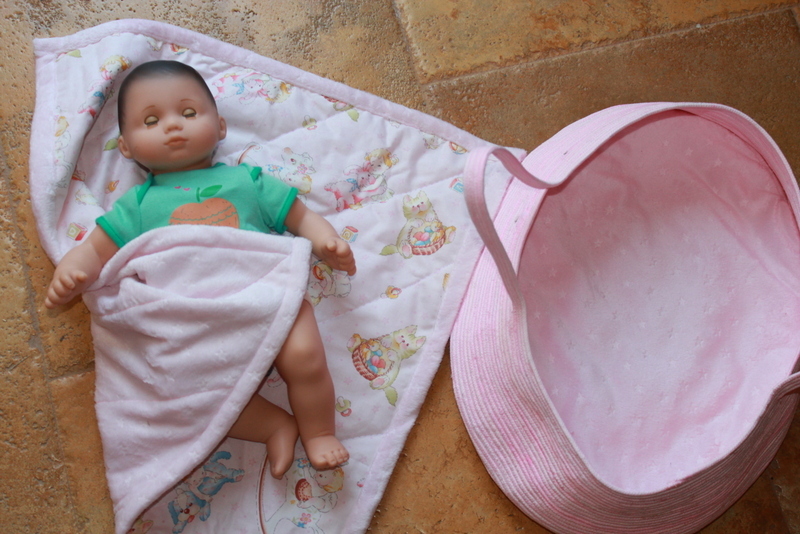 The bottom of my basket was a little wavy so I steamed it and ironed it until it was flat. 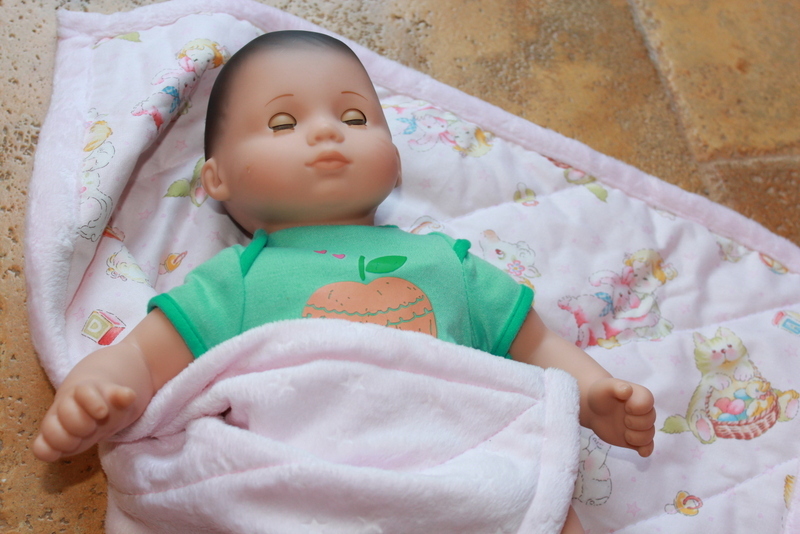 You are now done with your Moses basket. 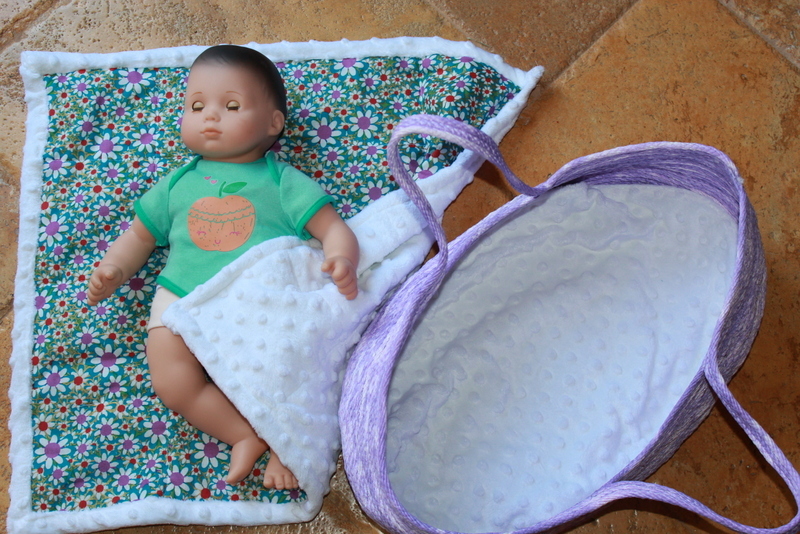 You are now ready to make a pad and blanket for your basket. 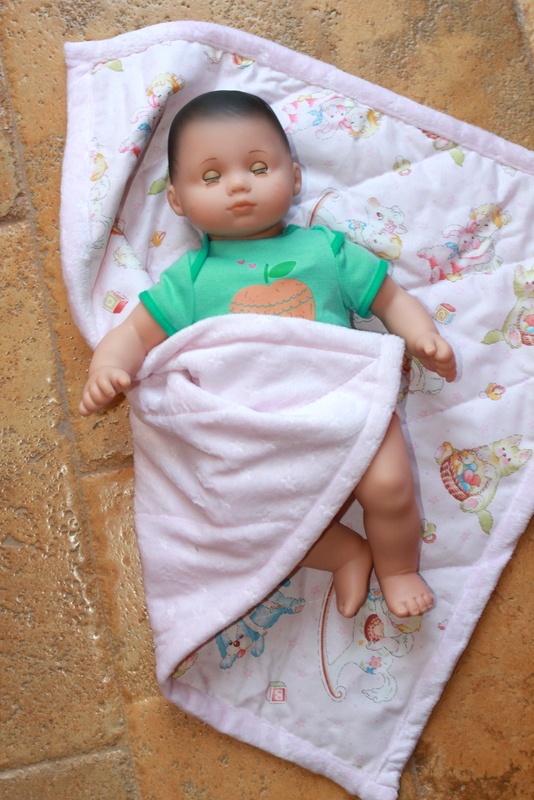 I use cotton fabric on one side of both the blanket and pad and on the other side I use a super soft minky fabric. 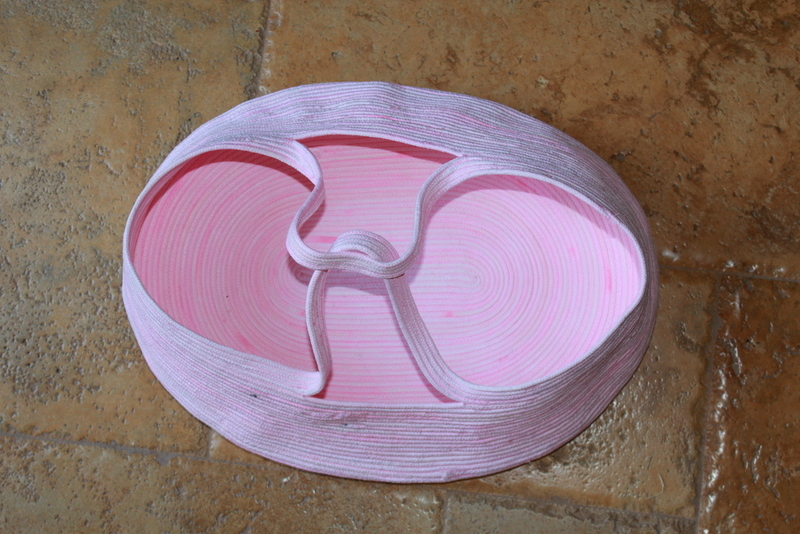 For the bottom pad: Place your basket on a long sheet of paper and trace around the bottom, marking your basket. Cut it out, adding 1/2 inch for seam allowance. 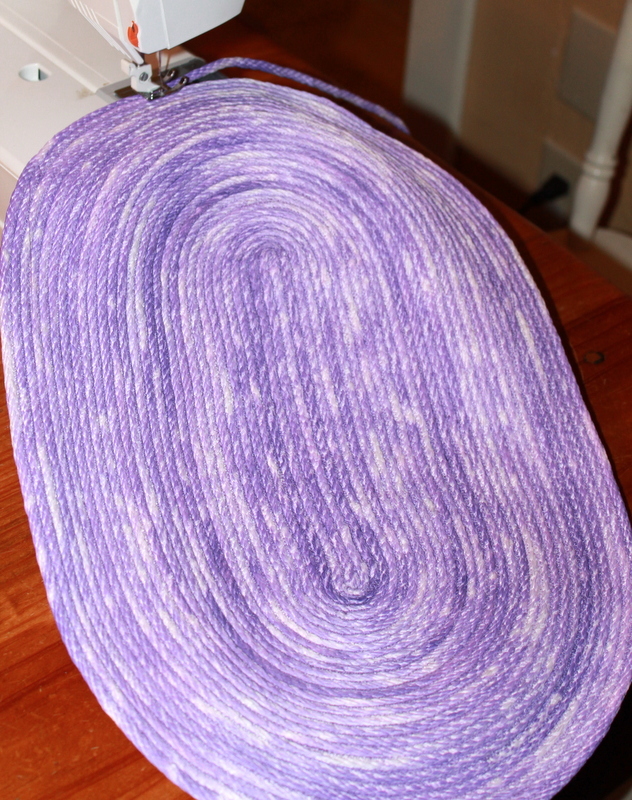 Lay it on top of your desired fabric, right sides together, place 1-2 layers of batting on the bottom. Sew the layers together leaving a 4-5 inch space to turn it right side out. Trim the seam then turn it right side out. 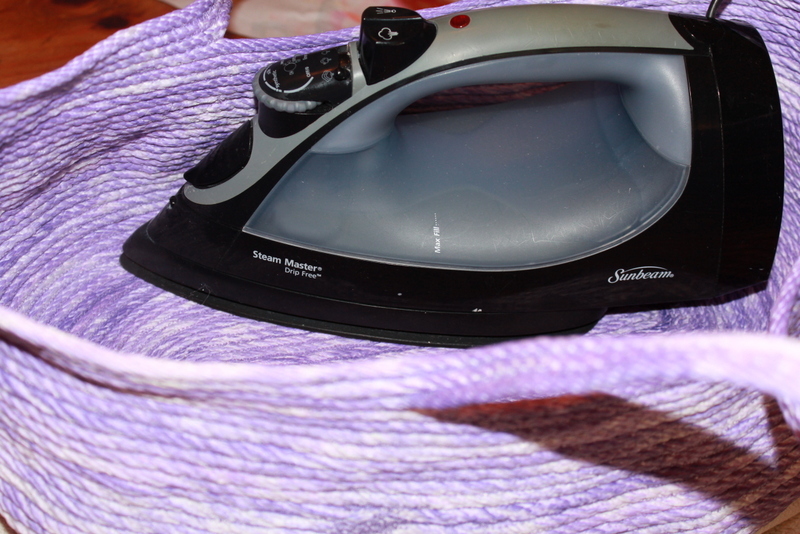 Iron your seams flat and sew along the outside edge of the pad. 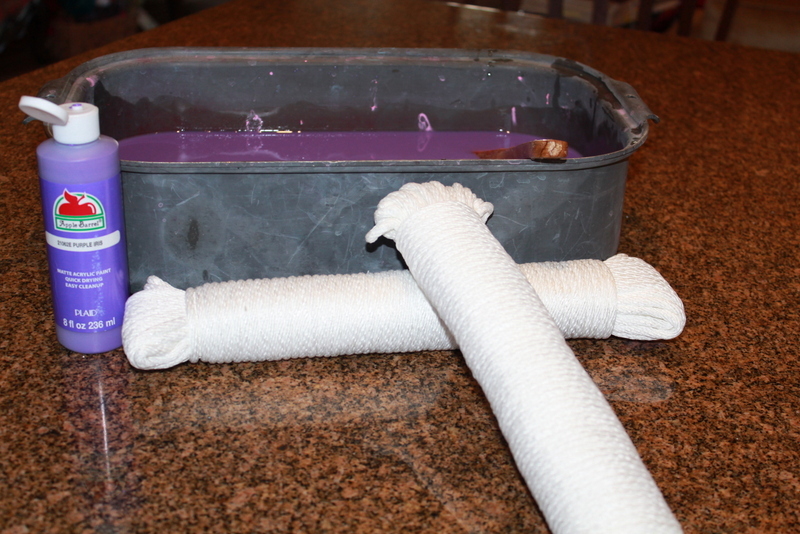 For the blanket: Cut your cotton fabric and one layer of batting 18×18 inches. Cut your minky 20×20 inches. Place your minky face down, place your batting and your cotton-face up- on top of your minky, leaving 1 inch evenly around the outside edge. Double fold the minky over the cotton and pin in place, making your blanket edge. 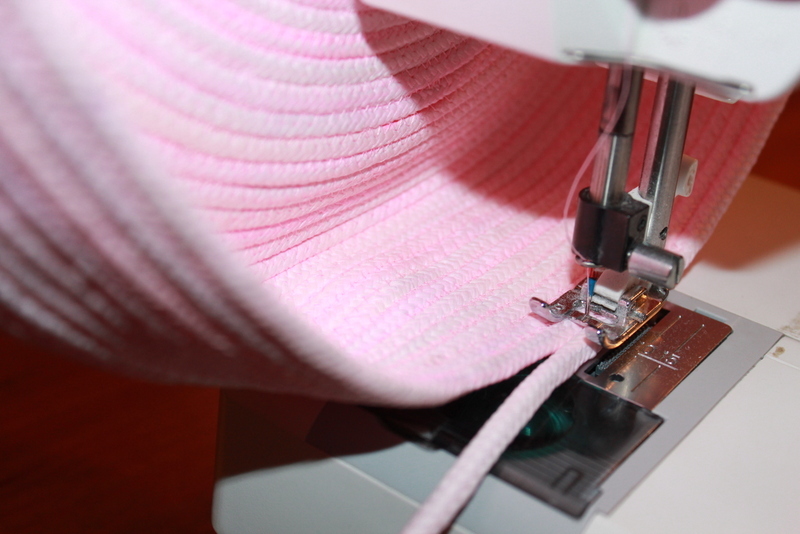 Sew the minky along all four sides. 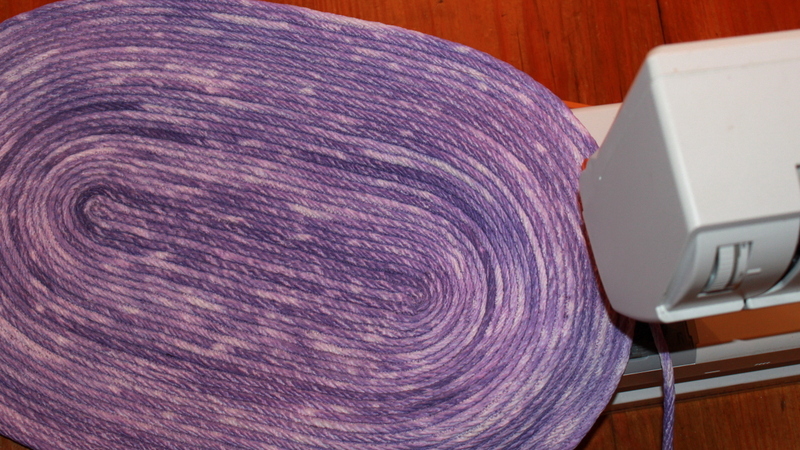 You can quilt it either by hand of on your machine if you would like. 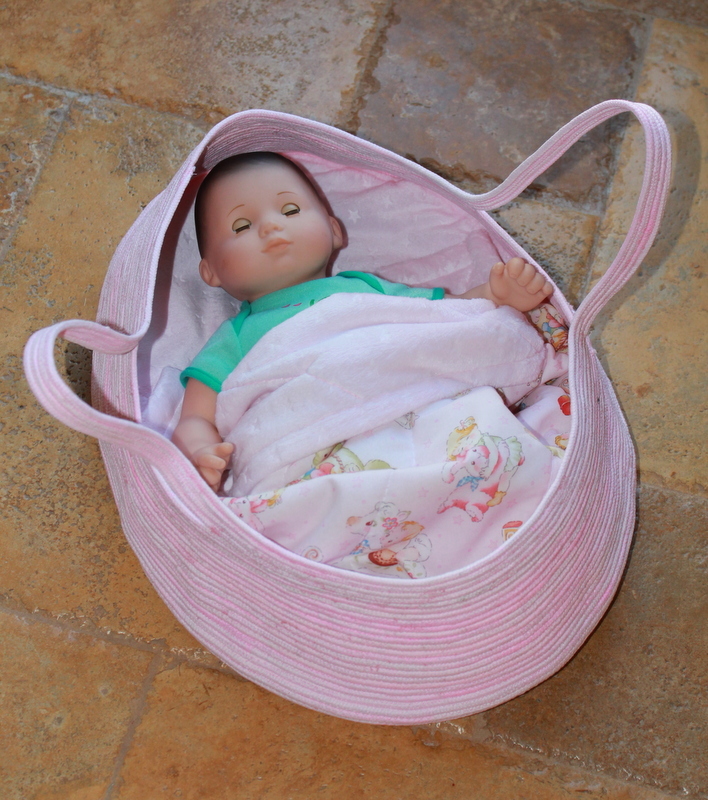 You are now completely finished with your Moses basket. 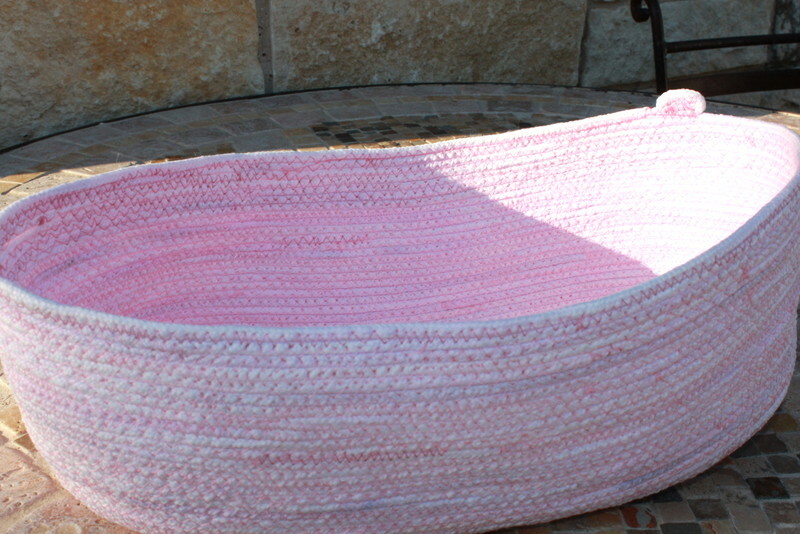 This Moses basket will be featured in my next Missions basket. I have also made a few baskets using this technique, here are a few pictures.